When you are scanning some secret information by cellphone, usually you don't want others to see it. This anti-peeping protective glass is specially designed for this demand. The material of the protective glass can effectively protect others from peeping your information, and it can also let you see the screen clearly. The optically-correct, hard surface resists scratches and abrasions to keep your cellphone looking great for years. It has also been precisely cut to provide perfect fitting invisibly protect your device. With this anti-peeping screen protector, you can use your cellphone safer. It is recommend that your cellphone case is not too tight for your cellphone so that there is a little room for the tempered glass, or the tempered glass will be easier lifting and peeling from cellphone due to the pressure of case. *Sensitivity of the Home Button: Go to your phone Settings menu - Display - Navigation Bar , you'll see the Hard Press Home Button feature. The default setting is 3, but you can increase this up to a stronger setting of 5. There is a test at the bottom of the screen that lets you gauge the sensitivity at each level, so go with what works for you. 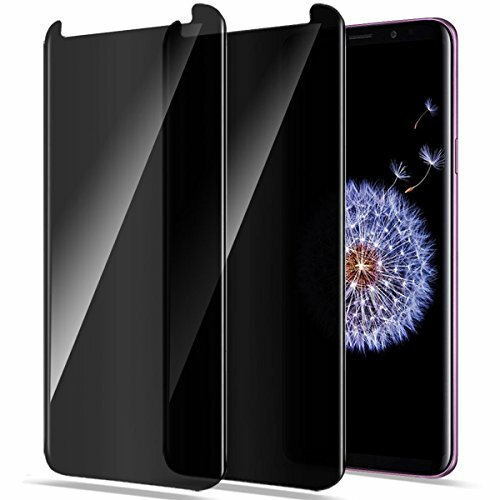 Case Friendly Screen Protector : Designed for Samsung Galaxy S9 PLUS (Not for S9). It cover most of the glass to protect against dirt, dust, oil and sweat effectively, but still leaves room for a protective hard case. 3D Curved Edge Privacy Screen Glass: only visible to persons directly in front of Screen, Keep your information invisible to other people besides. Edge to Edge, Easy Installation and bubble-free. 9H Hardness Tempered Glass: Protect your screen from from bumps, scratches, scrapes and other external damages.